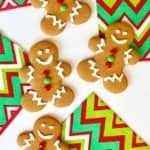 Easy, chewy, no-chill, cut-out sugar cookies that are perfect to bake and decorate for any holiday! 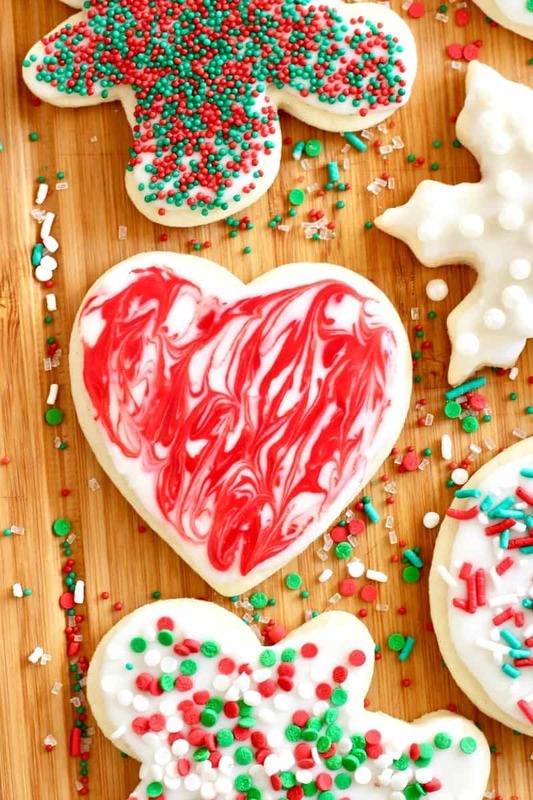 I’m finally finally finally getting around to sharing my favorite cut-out sugar cookie recipe that I’ve been making and perfecting for years. I can’t even tell you how many times I’ve emailed or texted this recipe to a friend asking for it so it’s about time I share it on here with all of you. It’s the perfect recipe. Most importantly, the cookies are delicious! We’re talking chewy and perfectly sweetened with a simple sugar icing that compliments it so tastefully. 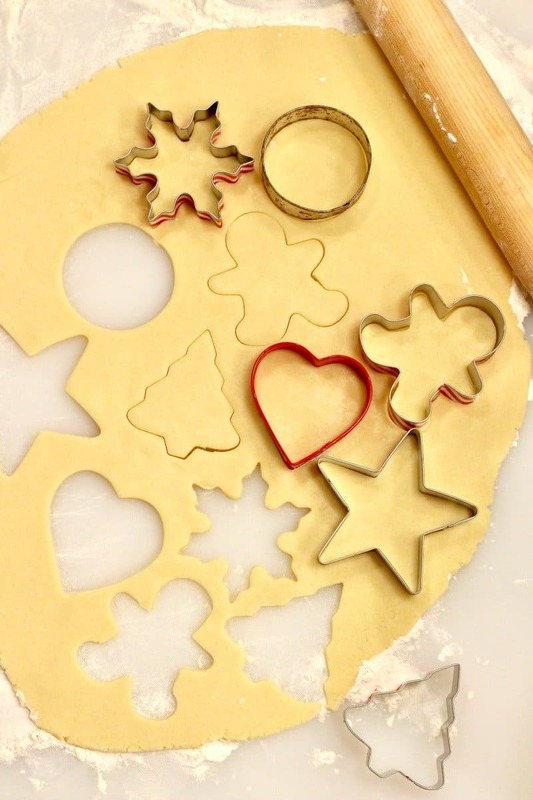 They’re so easy to make, super kid-friendly when it comes to rolling out the dough and cutting into shapes, and no chilling required which means you can mix the dough and have your first batch in the oven in no time. Because seriously, who really has the patience when it comes to waiting for cookies?? Especially the kiddos! The dough is balanced perfectly to hold its shape through baking, icing, sprinkling, serving and enjoying. I like flavoring the dough with almond extract, but vanilla extract and also peppermint extract turn out super tasty too. Feel free to use your favorite or switch it up each time. I also like the results I get from using half and half in both the dough and the icing. It adds just the right amount of rich moisture to the texture of the cookies and thickness of the icing. We bake this recipe all throughout the year. 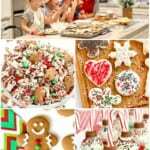 Whether it’s a birthday party, a football watch party, Valentine’s Day hearts for the school party, the Christmas cookie exchange or just our family in the kitchen having fun, this recipe is a success for any occasion. 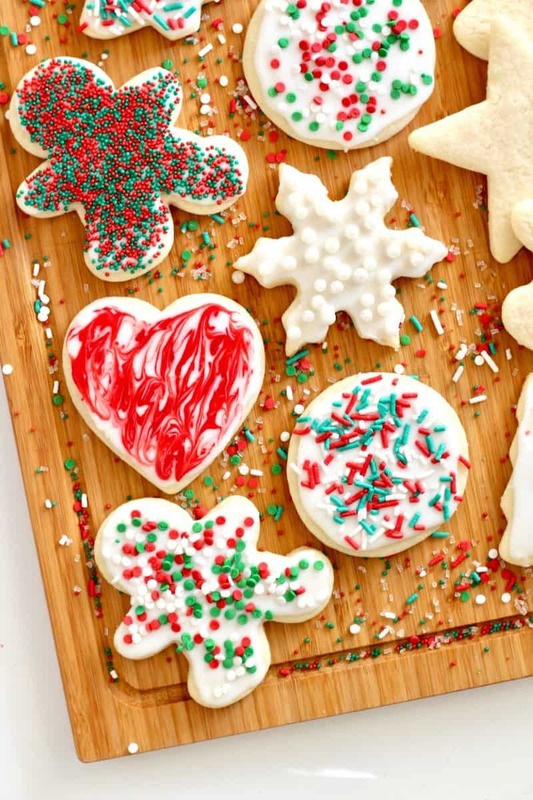 I hope baking, decorating and eating these sugar cookies brings sweet memories and delicious enjoyment to you and your family and friends for years to come. Preheat oven to 350°F. Line two baking sheets with parchment paper or spray with non-stick cooking spray. In the bowl of an electric mixer fitted with the paddle attachment, beat the barely softened butter and sugar until creamy. Beat in the half and half and almond extract and then the eggs, one at a time, until mixture is well combined. Add the flour, baking powder and salt. Mix on low speed until a thick dough forms. On a floured surface, roll half of the dough out to ¼-inch thickness. Cut into desired shapes. Repeat with remaining dough until you've used it all. 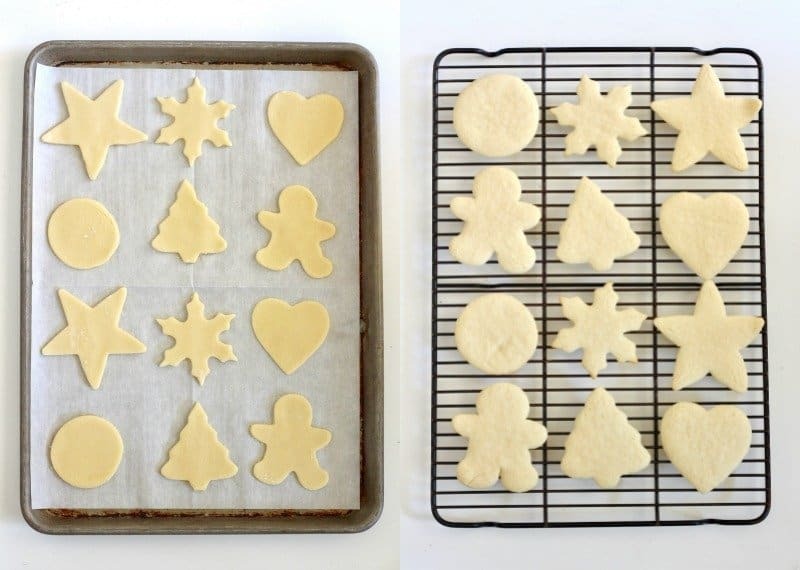 Place cookies about an inch apart on the prepared baking sheets. Bake for about 7-9 minutes, rotating cookie sheets after 5 minutes, or until cookies are just set and starting to turn light brown around the edges. Let cool on baking sheets for 5 minutes before transferring to a wire rack to cool completely. To make the icing, whisk 3 cups powdered sugar and ¼ cup half and half in a medium bowl until smooth and spreadable. 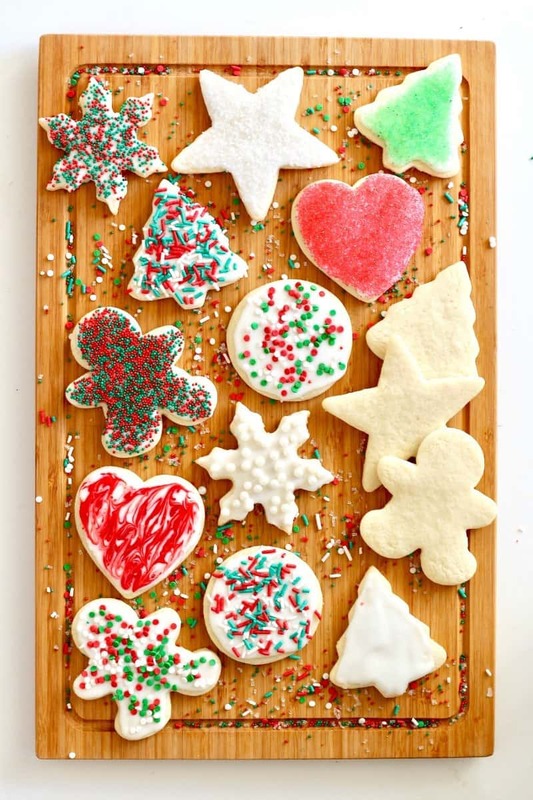 Spread a thin layer of icing on one cookie at a time and immediately garnish with sprinkles before the icing sets. Repeat with remaining cookies. Barely softened butter should still be cool to the touch, but when pressed using a little pressure, your finger will leave a slight indentation. 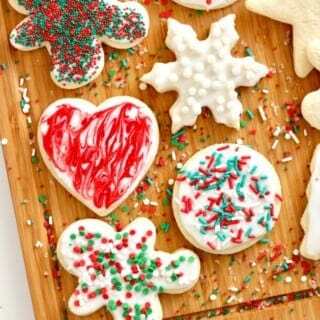 Baked cookies can be frozen for up to 6 months. 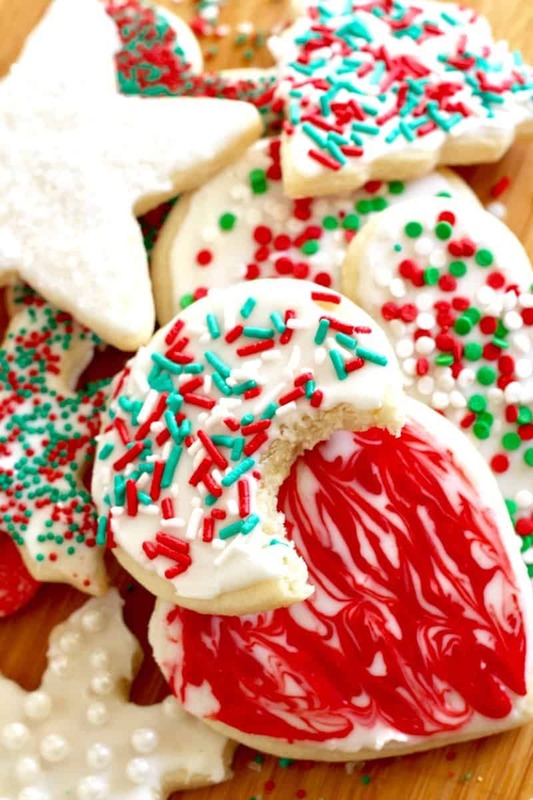 Let cookies cool completely, stack with parchment paper in between each layer of cookies and store in a freezer safe container or resealable plastic bag. Lay out to thaw completely before icing. Cookie dough can also be frozen up to 6 months. Wrap the cookie dough tightly in plastic wrap and then place in a freezer safe resealable plastic bag to freeze. Let defrost in the refrigerator overnight before rolling out and cutting into shapes to bake. Definitely trying this recipe this weekend with my little man!! 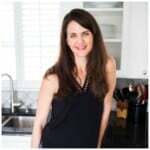 I love all of your recipes. This recipe absolutely works. Thank you! You are killing me with all these delicious recipes! It all looks so tasty! Finally! 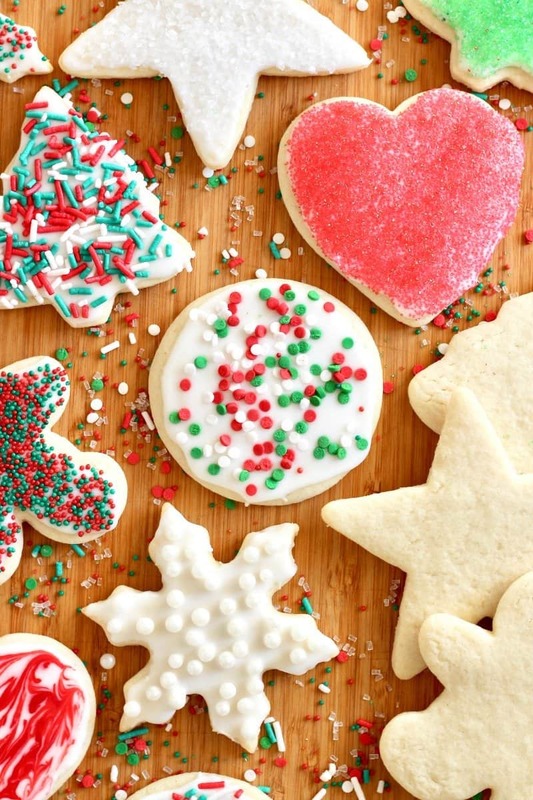 I’ve tried at least 20 different sugar cookie recipes over the years and yours is by far the best! Thank you for ending my quest. Does the frosting set up like royal icing? Hi Melissa! It hardens nicely like a royal icing, but doesn’t get so hard that it cracks when you bite into the cookie. Still a little creamy but hardens enough so you can stack them without the icing messing up. Hope this helps. Enjoy! I was so happy to find a no chill recipe! I don’t have half and half tho, only heavy cream so I’m gonna try it with that, hope it works ! I just pulled these out of the oven, and they are delicious. Now I just have to hope they aren’t gone before I get the icing made. Great recipe! Hi Lee-Ann! It’s an equal parts blend of whole milk and light cream. You can find it near the milk at the store. I made these cookies for a party yesterday and I noticed that the dough was much to wet for cut-outs, so I had to make drop cookies instead. The cookies were delicious, but do you think that dough would have been cut-out ready if I had added more flour during the mixing process? Thank you. Hi Natasha! Did you follow the ingredients exactly? The dough should be pretty thick and only require a dusting of flour on the work surface to roll it out on. Certainly if the dough was wet, it would need more flour. You could try adding more in the mixer or coating it generously on the work surface before rolling it out. Hope this helps. Oh goodness, Kaitlin! I’m wondering if your butter was too soft or if you missed a cup of flour when adding it? The dough should be really thick and require just a little flour on the surface to roll out. I’m sorry they didn’t turn out for you. If your eggs were really large then the dough was more wet so you would have to add more flour. its really 3 medium sized eggs. Hi Barbara! That’s a good point especially if someone has used x-large eggs. I always use large eggs, but I agree that eggs definitely vary in size. Thanks for sharing! Hi! I am baking a big batch of cookies and I was wondering if I can make the dough ahead of time? May I keep them in the fridge for say 3 days? Or better to just stick them in the freezer? Also, since it is a big batch, the cookies would end up pretty sturdy yes? Hi Emma! Yes, you can divide the dough into several balls and wrap each one tightly with plastic wrap to keep them in the fridge for up to 5 days. Just let them come close to room temperature so you can roll the dough out and easily cut into shapes. Yes, the cookies are sturdy yet chewy. Enjoy! Hi Denise! It’s half milk and half cream. I wanted to know your definition of “barely softened” since I think my butter was too soft and made the dough wet. So….my dough is in the freezer – chillin’. Hi Christine! Barely softened butter should still be cool to the touch, but when pressed using a little pressure, your finger will leave a slight indentation. Hope this helps. Enjoy! 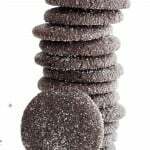 Could I add cocoa powder to make a chocolate football cookie? Hi Joelle! You could use whole milk or heavy cream. Enjoy! I tried you recipe and the dough was amazing! But the bake was not so good, the cookies tasted really hard. I know if I probably made t right it would be amazing!! Hi Deniz! It sounds like you may have over-baked them. Oven temperatures do vary so check them around 5 minutes and take them out when the cookies are set. Hope this helps. My daughter is home from college and was hanging out with a friend. They didn’t know what to do, so I suggested they put on some music and bake cookies. I searched for a no chill recipe, read the reviews on this one and checked my cabinet for ingredients. I didn’t have no salt butter, so they left out the salt. (After I read online that this is okay to do.) . These cookies were amazing! Perfectly moist in the middle, not crumbly and dry. I plan make them next time with no-salt butter, but using salted butter and leaving out the salt was not a disappointment. This recipe is a keeper! And the no-chill part will make this easy when I make them for Christmas! By the way, loved the icing too! 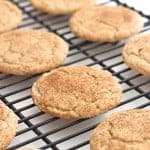 After searching for a great sugar cookie recipe for a couple years now, I have finally found a winner! I made these for the first time yesterday, and they are delicious! I iced about 3/4 of the cookies after they were done, and left 1/4 of the batch without icing… even without the icing they are wonderful. I will be making these again and again, and they will make some very scrumptious Christmas presents. I would like to use this recipe to make these with kids at a winter break camp. Will it work without a paddle mixer? We have hand mixers or our hands only. Hi Becky! Of course, just requires a little bit more effort and time to mix the dough together well. I hope they turned out great! Can you add food coloring to the icing? Sure! Just add it like you would to any icing recipe. Enjoy! Hello! My family and I bake for Christmas every year, and I found your recipe on my first try for a no-chill version. We were all excited by how easy and delicious they were, and they’ll be on our list every year! We all said our baking was less stressful this year! Kudos to you and thank you for sharing! Happy holidays! LOVE the recipe- the cookies were so soft and chewy and thick! The best tasting sugar cookies I have personally made yet. However, I have found in general, the dough does need to chill in the fridge even if it’s for 20 minutes. I started rolling the dough out and it was just too warm. My butter was barely soft, like you note but I feel for the perfect ‘cut out’, a good hour in the fridge is the trick! Just my take on it, but this was the best recipe I have come across by far! 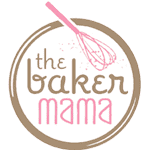 This is absolutely the best sugar cookie recipe I’ve ever used!!!! It’s quick to put together and not having to chill it makes it that much better. 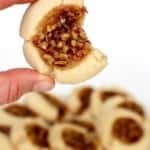 The cookies are always moist and have the perfect chew to them. Thank you Meagan for sharing your recipe. 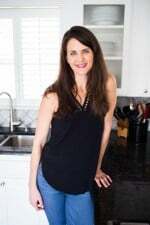 I’ve used this recipe dozens of times since finding it online and always get great compliments from friends, family and coworkers!!! !